Your wedding day is one of the most important days of your life and therefore one during which you want to take your time and enjoy every second. As a result, it can be a long day during which you may wish to vary the ambiance through a range of musical backdrops. Many brides therefore end up booking a string quartet for the service and reception, then something more lively for later in the evening and dancing and perhaps a DJ as well for late night ‘floor fillers’ which can end up being both expensive and complicated to arrange. However, an alternative suggestion to consider would be a versatile musical ensemble who offer a number of interchangeable band formats, using a core of musicians which is then added to during the course of the day, ending up with a full blown band. For example, a core of 4 string musicians would perform classical background music during the ceremony then during the drinks reception, they could perform a slightly more up tempo set to professionally produced backing tracks, which adds a contemporary twist. During the meal, percussion and double bass musicians could join the quartet to perform funky but laid back background music. As the evening falls, further musicians and vocalists join the ensemble to create more of a ‘big band or ‘show band’ ambiance performing a range of up to date chart hits, or alternatively the musicians play with a live DJ who mixes tracks while the improvising musicians jam alongside. 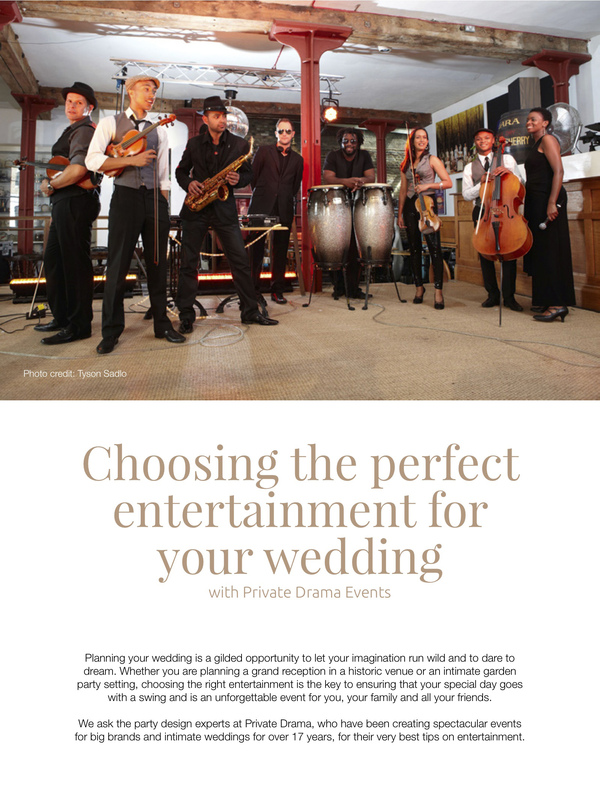 This type of ensemble is not only more budget friendly than booking a series of individual musical acts but offers a seamless flow of varied wedding entertainment throughout the day. Naturally every bride wants her day to be memorable and unique and she may therefore want to consider options for background reception music other than the traditional harp or string quartet. The music during this part of the days needs to be unobtrusive (to allow guests to mix, mingle and chat), to have a broad appeal (to entertain every guest from the youngest to the most senior!) and to be varied and perhaps even interactive (as often this part of the day during which the greet line and photographs may be taking place for quite some time). A perfect solution for this would be a ‘busking band’ who sing, play instruments and entertain and who therefore offer a number of advantages; firstly, they often offer a wide repertoire of music to suit all tastes, singing cover versions of old school classics, swing standards or current pop hits so no doubt have something in their repertoire to keep everyone happy; secondly they perform ‘unplugged’ so create a really natural, acoustic sound with no unsightly wires or speakers to get in the way, which contributes to their third advantage – being able to move freely, to roam around your guests, adding a personal touch by spreading their charm and interacting with groups of guests rather than being in a fixed location, perhaps some distance from many guests. At Private Drama, our speciality is to design bespoke entertainment solutions to fit our clients’ specific individual visions and desires. Often, a wedding is an opportunity for a family to create ‘a once in a lifetime’ fairy tale day or to arrange an out of this world surprise for the happy couple. For one particularly memorable wedding, we created a pop up Midsummer Night’s Dream immersive environment complete with costumed characters from the play who interacted with guests before later performing a well known passage from the play in and around the guests in the marquee. For another very lucky bride, her father’s desire was to surprise his daughter with a combination of all her favourite performances so we put together a bespoke programme including a pas de deux and a tap routine by English National Ballet from their acclaimed show “Strictly Gershwin”, performers from the burlesque London show ‘La Clique’ and even a performance by Will Young and his band. Given that all this had to be kept under wraps, all arrangements were codenamed and arranged clandestinely to ensure that the bride did not accidentally discover her surprise. Or for a truly outstanding experience for the happy couple and their family and friends, how about a stunning aerialist, accompanied by the soaring vocals of an opera singer, appearing as if from nowhere suspended under a giant helium balloon who swoops down to present a romantic keepsake – such as a red rose or a piece of jewellery – from groom to bride as part of her aerial ballet, then gracefully retreats into the background as guests go in for dinner …. What will you dare us to dream?